Feathered Quill Book Reviews - Find the Perfect Book for You! If you have a little time on your hands (pun intended) and love sports and science, you’ll love making your way through this eye-popping book. First up you’ll be treated to a bit of sports and then some science. If you’re a sharp thinker, you could even think of ways you could combine them. Perhaps you run in the opposite direction when someone offers you a jalapeño pepper. The running might be the sports part, but “why does eating a hot pepper burn my tongue?” is the science part. You’ll learn several interesting facts about capsaicin, the h-o-t part of that jalapeño. The capsaicin doesn’t bother birds though and you’ll read about one interesting thing that happens when they snag those hot peppers. Back to the sports section. Perhaps you are into baseball and want to know a few interesting facts about Honus Wagner. If you’ve ever seriously collected baseball cards you may or may not know that his is the rarest of the rare. Just why is laid out right in this book. I’ll only give you one hint and that’s that Honus played for the Pittsburgh Pirates. No, it’s not a good hint and you’ll just have to read this book to find out just why that card is so collectible. I will tell you that there were a couple of one-armed pitchers, Pete Gray and Jim Abbott. One played for the St. Louis Browns and the other for the New York Yankees. If you guessed who played for which team, you just might be correct. That’s just one more interesting fact in this “fact-cinating” book! This Book of Why is far from boring. The layout has great kid appeal, but very few grownups would be able to pass it by without taking a look. I know I did and couldn’t put it down until the very last page. Now that page told me a lot about HDTV and standard TVs. I’m now in the know, but not just about television. Full-color photographs swirl through these pages, many of them action-oriented while some are totally hot (think jalapeño here). Do you want to know who the fastest human was and is? Now just why does that baseball curve? How come we can stretch a rubber band way out and it returns to it’s original shape? You’ll find the answers to these questions and many, many more in this fabulously funtastic book. In the back of the book you’ll find an index, a glossary, and additional book and website resources to explore. 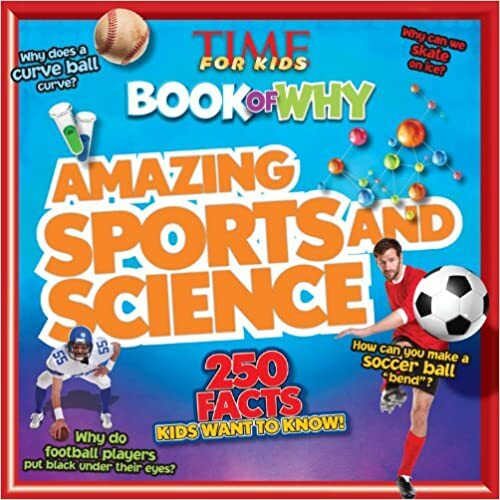 Quill says: The is a funtastic book of sports and science facts the young reader will love!